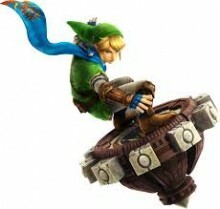 Youtube member swillo recently posted a video showing off one of the latest items in Hyrule Warriors, the Spinner. In the video we get to see Postman Link riding on the Spinner plowing through hordes of stalchildren displaying the various special attacks available when using the item. I am repeatedly amazed at how Hyrule Warriors took items that I never really liked using in Twilight Princess and made them into something I don’t think I would ever stop using. Somehow they made the situation “the postman on the top spinner” one of the most amazing looking aspects of a game that I would genuinely want to play. I can only imagine attempting to suggest that scenario in 2007 and seeing what responses I would get. Are you guys excited to try out the Spinner? Let us know your thoughts in the comments below!